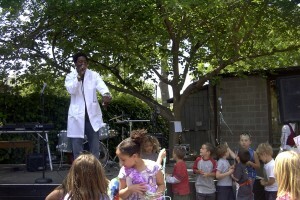 Hip Learning was founded by Oakland California rap artist and teacher Naru Kwina (AKA DR. Science). Inspired by his students ability to remember and recite songs they heard on the radio, Naru made Hip Hop songs about the human anatomy to lock in the information he was exchanging during class time. The children were so successful in processing the information in song format that Naru decided to share Hip Learning with the general public. Hip Science the Human Body 101 an audio CD was released in 2005. Due to a generous grant from the Creative Work Fund, Naru later wrote and performed in a full length play “Hip Science the Human Body 101Live”. Hip Learning then became available for concerts and workshops, schools, festivals, and science centers. In 2007-2008 Hip Learning was awarded a grant from the city of Oakland’s Cultural Funding Program to write a full color booklet to accompany the audio CD. The booklet is part fact part fiction and depicts the beautiful art work of Courageous Cunningham. Hip Learning is now in the formative stages of creating a Hip Learning hands on mobile science center\ performance vehicle to travel directly to schools and neighborhoods that are being under served in the San Francisco\Oakland Bay Area. We choose to focus on this instead of material wealth and promiscuity. And we are doing our part. This is by no means a cure to the current public educational system, a system that struggles on a daily basis to meet the needs of our children in crowded classrooms with scarce resources. Rather, this method will inspire our children, parents, and teachers to use every avenue available as we all journey towards our mutual destination: to give our children the means to become a productive and well-balanced person in our society. We envision HIP LEARNING © to be used alongside alternative educational methods as well as traditional methods to ensure that we reach as many of our children as possible.